This was the second article I had in print. 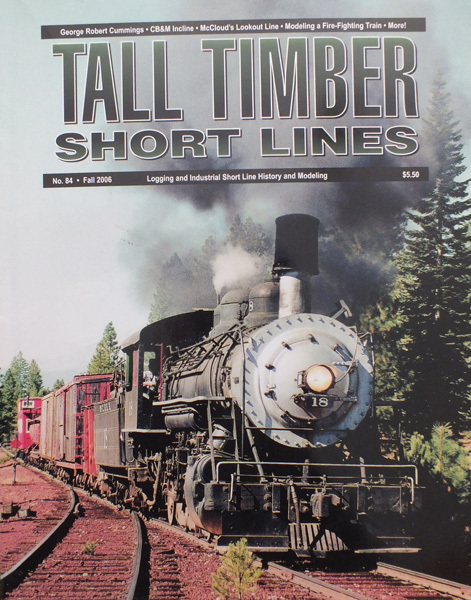 I discovered Tall Timber Short Lines a few years before this, and pitched the article to them. My sutsequent research turned up a few more details that invalidated some of the conclusions I drew and corrected some of the information presented. The real strength of this article lies in the photographs, all of them Eastman Originals from the University of California-Davis library special collections. Unfortunately, TTSL ceased publications a few years ago, but back issues (including this one) are still available through NorthWest Short Line, corporate successor to Oso Publishing.